Inviting four-season end-unit town home with warm ambiance, all the comforts you need with great views. A mountain vacation getaway at a GREAT VALUE. 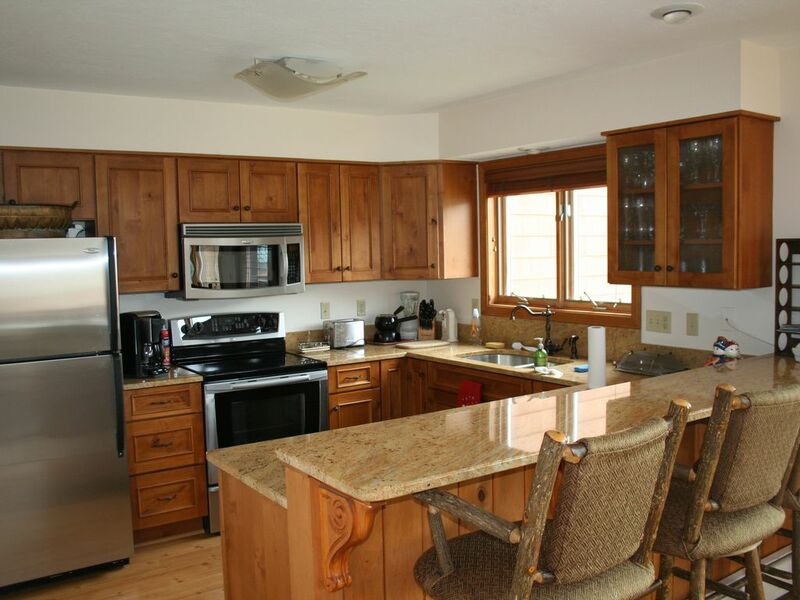 Modern, fully equipped kitchen, comfortable dining and living room with fireplace/flat screen TV. Four bedrooms, three floors, each with private bathroom (three full, one with shower). RECREATION ROOM with foosball, and ping pong. Also, enjoy the large, flat screen TV while , from the comfortable, sectional sofa with ample seating for everyone! The outside deck with chairs provides an opportunity to enjoy the wildlife and mountain views in warmer weather. Full range of amenities depending on the season and your interest. Experience the east coast's longest and most exciting zip line, and visit all nearby attractions, such as Story Land, Flume Gorge, Saco Lake, golf and tennis on the property, horseback riding, hiking, and so much more! A free shuttle throughout resort is door to door, and 24/7. A clean and comfortable home in a great location. Plenty of bathrooms for all guests, well stocked and organized kitchen . Owner very accommodating. Very responsive host, nice large home! Condo has contractor level amenities. Not sure what room had the King Bed, but we did not find it. Found 2 queen, a double, and 4 twin. Lots of kitchen goods, very helpful! And playroom with ping pong and Foosball was fun! Lots of Room here to spread out! Great place, great host, CLEAN, awesome location....I don't have anything negative to say except I wish I booked a few more days there. Great location in Mt. Washington. I would highly recommend this rental for families/groups. All the amenities you would need. Clean and spacious! Great views! This area allows you to get away from all the commercialization everywhere. Our family hiked up Mt. Washington and the location worked perfectly for us. Very nice. We loved our stay here! We had a group that was going hiking on Mt. Jackson and it was a great place to come home to after. The kitchen was also a great space to cook in if you’re looking for a place where you can make a meal. It is really spacious and the game room downstairs was fun to have. Overall we could not have been happier with our stay here and would definitely want to come back again! This was a perfect place for our weekend getaway in which we were going to Storyland and Santa's Village. The location was ideal as it was equidistant from the 2 parks. The place was very clean and had big bedrooms each with their own bathrooms. The owner was very helpful with checking in and showing us around. Agent, Kathy Bogan has been renting properties in Bretton Woods since 2002. Also a homeowner, she has a wide range of experience both owning and renting properties in an area that she describes as "magical". As the owner of VIP Vacation Rentals LLC, she is very familiar with all of the different types of accommodations at the resort, surrounding areas, and attractions. Owners are a family of avid ski racers who love all the outdoors sports in all seasons (hiking, tennis, golf, swimming, etc.). After a day outdoors, we like to have a very warm and inviting home for family and friends. Best and earliest snow in the winter anywhere in the White Mountains. Mt. Washington has its own micro-climate. Great outdoors in the summer. Best foliage in the fall in the nation. Easily accessible from anywhere South of New Hampshire. Nearby lakes and rivers offer rentals. The ski area is part of the resort, less than 5 min. from the house; just across the road. Tennis Courts in the Community. Free. Tennis Courts Also Available at the Omni-Fees may apply. Available at the Omni golf course and Bethlehem area. Thank you so much, Cesar. We really appreciate your favorable comments, especially since the property has a new housekeeper. We would be pleased to have you again. We had a great time at the condo. It was clean and all the necessary accessories were there in the kitchen. Great view of Bretton Woods! We had a wonderful time and the condo was well appointed. It included everyting we needed for a great weekend. Looks like updates are coming since we saw paint swatches on the wall. The foosball and ping pong tables were a HUGE hit and a highlight. Unfortunately most of the board games were missing a lot of pieces and all mixed up. The sleds in the closet were a bonus! The location and view can't be beat and a lot of space for the two families and kids to have some space to themselves. Kari, we appreciate your feedback and your 5 star rating. We know you are busy, so we thank you very much for your review and look forward to having you again. We not new to Bretton Woods, but this was our first time at this property for a long weekend. It was great place to stay for a family of five - PLENTY of room, could definitely accommodate a larger group. Our kids loved the ping pong table and foos-ball table downstairs. We watched the NFL Playoffs game on the big TV downstairs. Hi David. I really appreciate your taking the time to review this property for us, and for the 5 star rating. Thanks so much for your positive comments. I'm glad you and your family enjoyed your stay, and we would be happy to welcome you back again! Instructions for access were very thorough. The condo is lovely and comfortable, nice kitchen, gameroom was really great for kids. Carpet in upstairs was super soft and cozy. The only slight knock was that one couple in our party reported that the bed in the master bedroom was bowed toward the middle and not that comfortable. The one suggestion I would make to the owners is to stock at least soap in the showers/tubs. We brought some soap (we were aware that there would be none) but did not bring several bars to stock every bathroom. Hi Susan. Thank you so much for the feedback and taking the time to review the property. I'm sorry about the soap (which we will be sure to tell the housekeeper), and I will mention your observation about the bed to the owners. We really appreciate your five star rating, and hope that you have a wonderful holiday. Great place and would recommend!! Spent the weekend here with family for a wedding at the Omni. The place has everything you could need and tons of space. We really enjoyed using the game room to play foos ball and table tennis. Every bedroom has its own bathroom - that’s amazing! The owners sent over a nice information packet that went over everything you would need to know. Another plus is the shuttle service that runs 24/7 to the main hotel. I would recommend this property as well as rent again. Rates are subject to change until confirmation of reservation. Holiday Rates are extra, and have a 3 - 4 night minimum. Please inquire. Standard rate is an average of year round rates with a 2 to 3 night minimum stay.